Are you looking for a delicious cheese recipe with a difference? If you are, you’ve found it! Here’s my sweet pasta filled with ricotta, hazelnuts, orange and chocolate for you to enjoy. We love our pasta in Italy – so much so that we like to eat it for dessert too! These little halfmoon-shaped pasta treats are perfect eaten at the end of a meal or with coffee or a chilled glass of sweet white wine. The combination of nuts, honey and chocolate make them very rich and perfect for festive entertaining. 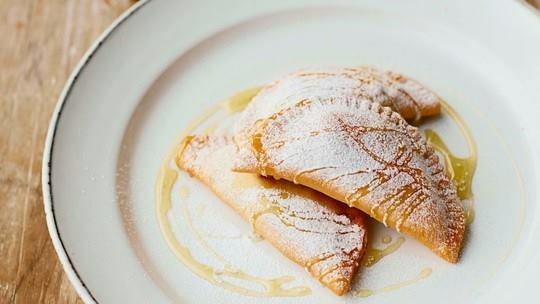 Feast your eyes on the finest sweet pasta filled with ricotta, hazelnuts, orange and chocolate! It’s straightforward and fun to make this great dish. Simply follow the instructions below and get the perfect result. Beat together the eggs and egg yolk. Place the flour in a large bowl and add the sugar and butter, then add the eggs. With the end of a wooden spoon, bring the mix together, adding a drop of water if you need to. Once the mixture starts to come together, turn it out onto a clean work surface and start to knead the dough until the surface is clean and the dough smooth. Wrap in cling film and leave to rest for 20–30 minutes. Meanwhile, combine the ricotta, orange zest, hazelnuts and chocolate chips, adding a tablespoon of sugar, if you like. Set aside. Unwrap the chilled pasta dough onto a well-floured surface. Flatten it down slightly with your fingertips then roll it out until it is 2mm thick, or use a pasta machine – if you have one. Once thin, cut out 12 discs of pasta using a 10–12cm cutter. Brush around the edge of each disc with a little egg wash, then place a spoonful of the ricotta filling in the middle of each disc and fold the one half of the pasta circle over the filling, creating a half-moon shape. Press down firmly around the edge, then use a fork to press the edges together. Heat 5cm oil in a saucepan. To check if the oil is hot, add a little offcut of pasta to the oil – if bubbles start to appear around it and it floats to the top, it is ready. Fry the half-moons in batches. Cook for 1½ minutes then carefully turn them over and cook for 1½ minutes on the other side. Remove with a slotted spoon and drain on kitchen paper. 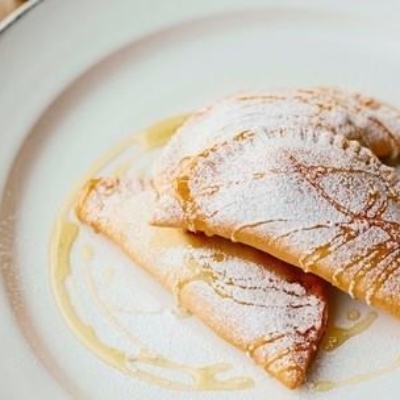 Serve immediately drizzled with honey and dusted with icing sugar. 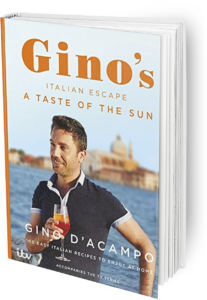 Once you’re done, simply sit back and enjoy your sweet pasta filled with ricotta, hazelnuts, orange and chocolate and don’t forget to check out other great authentic Italian recipes including great antipasti recipes, Italian pasta recipes, Italian soup recipes, Italian beef dishes and authentic pizza recipes.